SMM records the increasing number of civilian casualties on both sides of the demarcation line. The militants of the so-called "DPR" (Donetsk People's Republic) deployed a piece of artillery near the residential area in the Donetsk district of Trudivskyi, in violation of the Minsk agreements on the withdrawal of weapons, OSCE Special Monitoring Mission in Ukraine reports. The SMM report indicates that the UAV of the mission found the militants' firing position in this area. “Aerial imagery available to the SMM revealed the presence on 26 July of one piece of towed artillery (type unknown), in violation of withdrawal lines, and in close proximity to residential areas in northern Trudivskyi area of Petrovskyi district of “DPR”-controlled Donetsk city, with eight military-type trucks nearby… Aerial imagery available to the SMM revealed the presence on 26 July of an area of probable firing positions in western Trudivskyi area and a compound with three military-type trucks, along with three impact sites nearby”. The Trudivskyi area, which is located in the western part of Donetsk, is considered to be dangerous. The militants systematically accuse the Armed Forces of Ukraine in shelling this territory. 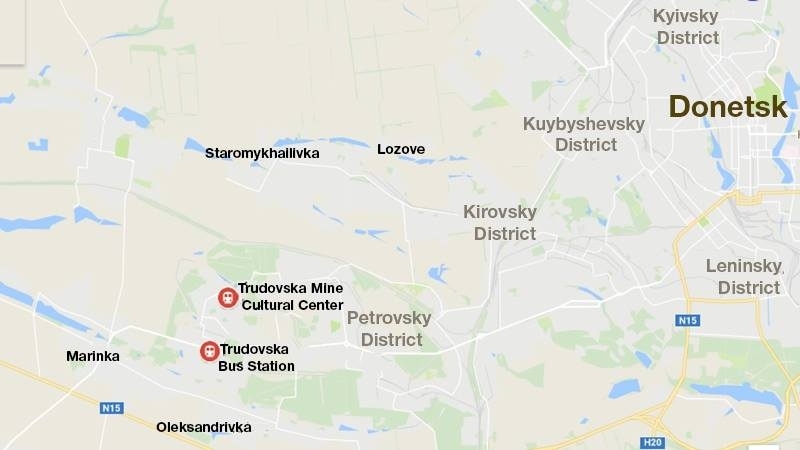 At the same time, the ATO (antiterrorist operation) headquarters reported that the militants deploy armaments in Trudivskyi area and have been firing residential areas of the government-controlled settlements through the contact line. For example, according to the information of the ATO headquarters, on July 12 Marinka was fired from the large-caliber machine gun which was located by the militants in Trudyvskyi area. In addition, the OSCE SMM reported that the separatists had not allowed the SMM patrols to visit Novoazovsk and the areas adjacent to the uncontrolled border with the Russian Federation, as well as to the settlement of Sedovo located on the Azov coast. 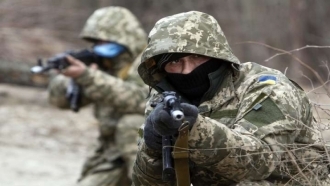 “Three armed “DPR” members at a checkpoint on road E58 north of Novoazovsk prevented the SMM from proceeding south towards the town and east towards the border with the Russian Federation… At a checkpoint about 1.2km north-west of “DPR”-controlled Siedove (33km north-east of Mariupol) armed men again prevented the SMM from proceeding towards the town, citing orders from superiors”. "DPR" militants have been systematically blocking patrols of international OSCE observers for the last month, not letting them pass to Novoazovsk, Siedovo and the territories of the OPDO (special territories of Donetsk region) adjacent to the border with the Russian Federation. A patrol led by the Principal Deputy Chief Monitor of the OSCE Special Monitoring Mission to Ukraine Aleksander Hug, stayed for three hours at the militants checkpoint near Novoazovsk, but had not received permission to travel last week. The militants referred to the bans of their superiors, and the JCCC (Joint control and coordination center on ceasefire and stabilisation) said that it could not influence the situation. OSCE SMM mandate provides for safe and secure access throughout Ukraine, including not controlled by the government areas, and militants leaders have no right to prevent them from accessing in spite of the decision of the 57 OSCE member countries, the Mission stresses. “All signatories of the Package of Measures have agreed on the need for this safe and secure access, that restriction of the SMM’s freedom of movement constitutes a violation, and on the need for rapid response to these violations”. Aleksander Hug called the occupied areas of the Donetsk region east of Shirokino near the uncontrolled Ukrainian-Russian border, Novoazovsk and its surrounding area as the "information black hole". SMM also repeatedly reported that the Mission's patrols, detained at the checkpoints of militants near Novoazovsk, witnessed the active movement of military trucks, other military equipment and people in uniform in this area. OSCE SMM in Ukraine also published updated information about the civilian victims of the conflict in eastern Ukraine. Thus, from the beginning of 2017 as of July 24, the OSCE CMM confirmed 330 cases of civilian casualties on both sides of the contact line in Donbas with 59 dead and 271 wounded. The report also contains data on dead and wounded civilians in the past two weeks. “The violence resulted in a number of civilian casualties with three people killed and eighteen injured from 10 July to 25 July. This brings the total number of civilian casualties confirmed by the SMM in 2017 to 330, including 59 fatalities”. The OSCE SMM reported that the number of civilian casualties since the beginning of this year is more than 50% higher than the number of victims for the same period in 2016.